Fits 2014-2017 BMW X5 F15. Premium OE factory style running board. SIDE SKIRT. Style OEM Style. Add an extra safety and security as the side protection for your vehicle. These procedures should not be attempted by “do-it-yourselfers. 2007-2012 BMW X5 E70 models only. Our Running Board is made with aircraft grade aluminum to give you one of the most durrable and lightweight SUV running boards on the market. Made from extruded aluminum and top off with a skid resistant top. OEM Style Aluminum Running Board 14-17 BMW X5 F15 Fits year: 2014-2017 Fits make & model: BMW X5 (Excluding M Package) Direct Bolt-on 100% brand new Perfect OEM replacement Trimming of undercarriage plastic cover is required for most vehicles during installation Shipping Info Return and Exchange Payment Info Contact Us All rights reserved. Copyright 2015 Auto-Beauty, Inc. The included components are both footboards, supports, covers, and inserts for each side. Part # 51952357132. BMW X5 2017. 2007-2012 BMW E70 X5 MODELS ONLY. 1 PAIR OF SIDE STEP RAIL NERF BARS/RUNNING BOARDS. SPECDTUNING INSTALLATION VIDEO: TRUCK SUV SIDE STEP BARS INSTALLATION. BLACK ANTI-SLIP POLYETHYLENE STEP DOTS. BLACK COATED SILVER ALUMINUM TUBES & BRACKETS. For sale: 2014 2015 2016 2017 2018 BMW F15 X5 SIDE ROCKER PANEL RUNNING BOARD SET PAIR ORIGINAL OEM. These are not the side step running boards and they are not M-Sport models. OEM used part. 2014-2018 BMW X5 F15. 3" Nerf Bar. 4" Nerf Bar. 5" Nerf Bar. Style & Surface-finish. Any item in poor condition will not be credited. We reserve the right to cancel any unwanted orders. Direct Bolt-On. Installation : Installation Instruction NOT Included, Professional installaion highly suggested. Direct Bolt-On. Hardware & Brackets Included. 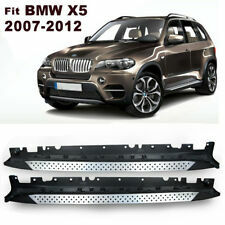 For 14-17 BMW X5. Aluminum - Running Board. Color Black | Silver - Running Board. 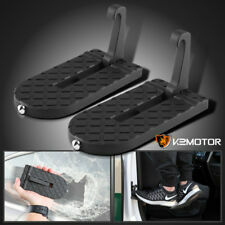 Provides a convenient step position. Doesn't fit for M sport model. We will do our best to help you solve every problems you have. Trending at $610.03eBay determines this price through a machine learned model of the product's sale prices within the last 90 days. 2007-2012 BMW E70 X5. Made of high quality aluminum in black coating material with PVC non-slip poly step pads. SPECDTUNING INSTALLATION VIDEO: TRUCK SUV SIDE STEP BARS INSTALLATION. Add an extra safety and security as the side protection for your vehicle. Part Number 51777207197. Year/Model 2007 BMW E70 X5. Help Coming Soon. along with the RMA number. Aurora, CO, 80011. Colorado Imports, Inc. Extended warranties available. No labor warranty is provided. 2014-2018 BMW X5 F15. 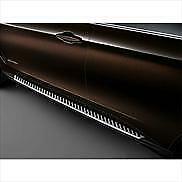 4" OVAL S.S NERF BAR SIDE STEP RAILS FOR 99-17 CHEVY SILVERADO 1500 EXTENDED CAB. Material: Aluminum. 1 pair running boards (left & right side). 2009-2018 DODGE RAM 1500 S.S BULL BAR W/SKID PLATE BRUSH PUSH GRILLE GUARDS. Model: BMW X5. Running Boards. Part Grade Abbreviations. cc = Credit Card size units. C = Greater than 200k miles. B = Greater than 60k miles and less than or equal to 200k miles but greater than 15k miles per year. 2007-2013 BMW X5. This is an after market part, not OEM one. Hardware Included. 2014-2018 BMW X5 F15. 1 Pair OE Style Running Boards Necessary Mounting Hardware Installation Instruction. No exceptions. Any item in poor condition will not be credited. Custom fit applications for each vehicle. Specific notes about the condition and options are found below. The warranty period starts when you take possession of the part. No labor warranty is provided. ★ 14-17 BMW X5 F15. ★ Surface Finish: Aluminum & Black ABS Plastic. Maximum 500 LBS Load bearing for each side. Let's solve the problem together! stainless steel tube maximized the dust proof specific. Fit 2014-2017 BMW X5 F15. 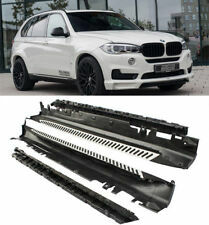 2 x Running Boards (Left and Right)(Hardware Included.). Side Step Bar. Style: OE Factory Style. Provides a convenient step position. Side Skirts. Front Bumper. Adds a sporty accent to your vehicle. Model: BMW X5. Running Boards. We're not responsible for installation errors, labor expenses and/or any other expenses that may occur. BMW X5 2007 2008 2009 2010 2011 2012 2013 Right Passenger Side SKIRT ROCKER MOLDING PANEL OEM 51777163556 ( Textured Black Color ) has minor nicks / light scratches as wear ( see pic. # 7 ) Otherwise Skirt is in Great Used Condition: All Tabs Intact, BMW Factory Original Part, Nice with Total Good Price ! Fits on BMW X5 E53 2000-2006 model,Original car need without Factory Running Board. See the photo of the item. 2014-2018 BMW X5. Our catalog includes over 2000 products in over 20 categories. We support vehicles produced from 1995 to 2018. We are also constantly updating our catalog. OE Style Aluminum Running Boards. 2007-2012 BMW E70 X5. Rear Bumper Step. made of ultra strong and light weight black coated silver aluminum. Load capacity : 500 lbs each side. Add an extra safety and security as the side protection for your vehicle. 2007-2013 BMW X5 E70 models only. A Pair ( Both Passenger & Driver Side ) Side Step Bars. Enable you to reach roof rack/roof box more easily on the side step bars. Each running board has a load capacity of 500lb. 2007-2013 BMW X5. 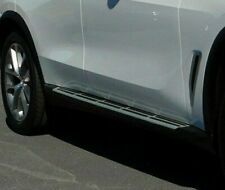 OE Style Aluminum Running Boards. Aluminum & Black ABS Plastic. These running boards will surely look great. Warranty only covers rust/corrosion, and manufacturer defect. Our team includes trained experts with many years of experience in the industry. OEM Style Aluminum Running Board 14-17 BMW X5 F15 Fits year: 2007-2013 Fits make & model: BMW X5 (Excluding M Package) Direct Bolt-on 100% brand new Perfect OEM replacement Trimming of undercarriage plastic cover is required for most vehicles during installation Shipping Info Return and Exchange Payment Info Contact Us All rights reserved. Copyright 2015 Auto-Beauty, Inc.
BMW X5 (F15) 2013 - 2019. ALUMINIUM EDGES. RUNNING BOARD SIDE GUARD PROTECTOR SIDE STEP. 2 pieces for right and left side. 3D Design with one piece ( Monoblock ).